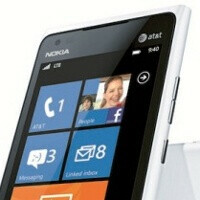 The AT&T-bound Nokia Lumia 900 is the first LTE Windows Phone handset by the Finnish manufacturer and it’s expected to launch big on the second-largest US carrier come April 8th. But if you’ve already marked the date on your calendar, broken the piggy bank and have that spare $100, don’t hurry. The Lumia 900 is coming in beatiful white on April 22nd, and for those of you having an affection for pale gadgets, this shouldn’t be too long. Otherwise it’s the very same device with the same internals. Your two other options are black and cyan arriving on April 8th. So will you wait? Wish there was a green one, like a dark olive green. The cyan looks great and all, but it also looks too close to the blue Wii. I'm really tempted to buy this phone, specially in white. I can't wait for Apollo. This is one beautiful phone. Same as Lumia 800 and N9 are. I'm returning my two week old iPhone 4S !